I have to admit I had no idea what a pierogi was last Friday morning. Yes, I know I was living under a rock or something. I had heard the name, but had no idea what they were, or had ever seen one. I guess that’s what you get for growing up in a small town. As for the last ten years, well, I have no excuse but to say that the area I live in is so Hispanic, I’m obsessed with trying Hispanic and my other favorite, Asian cuisines, because of the close proximity of a large Asian grocer. 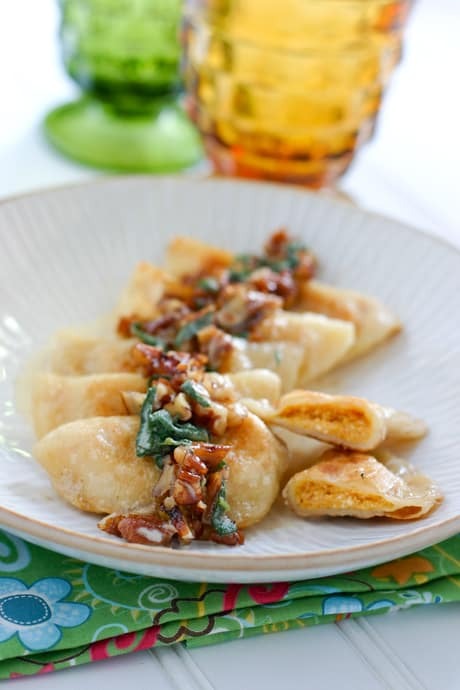 Friday morning, I called up my husband and we were talking about what I could make for pumpkin week, and he said what about a pierogi, and I said what? Then he goes on to say how his mom use to make them all the time, and how great they were. It’s funny we’ve been together now 16 years, and I have never heard him utter the word pierogi. So I decided to give them a try. They were so good, addictive really, and I can’t wait to make loaded potato pierogies soon. 1. Whisk eggs and sour cream together. Add flour and salt. Work together with your hands, like a biscuit dough, kneading in the bowl, until the flour is incorporated in the dough. 2. Divide dough in half. Wrap in saran wrap. Let dough rest for 30 minutes in the refrigerator. 1. Combine all ingredients for filling and mix well. Set aside. 1. Take one half of the dough and place on a very lightly floured work surface. Lightly flour your rolling pin and top of the dough. Roll dough out until it is very thin, 1/6 inch. You may have to add additional flour to keep dough from sticking while rolling. Use a biscuit cutter or glass (I used my tea glass) to cut out the circles in the dough. The dough will probably be stuck to the table at this point. Take a kitchen bench scraper, and wiggle it under the dough circles to get it off. Do this very carefully. 2. This is important, now that your dough is on your scraper, turn the dough upside down in your hand or on the counter, so that the part you were rolling is down, and sticky side is up. Now play with the dough a little if you need to adjust the circle back to size, then add a very small amount of pumpkin filling, about a teaspoon. Fold the dough over and press it with your fingers to close, being careful not to tear the dough. Place pierogies on a cookie sheet. 1. Fill a large soup pot water. Salt the water. Bring to a boil. Drop about 10 pierogies in the boiling water at a time, vertically, as not to let them flop in horizontally and splatter boiling water on you and burn you. When they float up to the top, they’re done, remove with a slotted spoon to a colander and rinse with cold water to stop the cooking process. Then return to a cookie sheet. 2. Then add 4 tablespoons of butter to a large skillet and melt. Add a single layer of pierogies. Over medium low heat, brown the pierogies on each side, and remove from pan. If butter starts to get burnt areas in it, clean pan between batches. Add fresh butter between batches if needed. 3. For the last batch of pierogies, use fresh butter. Add pecans at the same time you are cooking the pierogies. Remove pierogies when browned. Add sage and saute for about a minute. Add cream and bring to a simmer. Simmer until thickened. Serve over pierogies. This dish looks incredibly delicious! I have only had pierogis once (and it was a long long time ago) but these look absolutely addicting. I have a feeling that once I tried one, we would be making these babies every week! This looks and sounds like a true fall treasure. Thank you for sharing them with me…and congrats on making your first batch! So glad your pierogies turned out – and beautifully! Heading over to check them out! Why can’t I see the reciepe? LOL..never mind..I found the link!